UBCD is one of the oldest LiveCD distributions I know. It seemed to stall in recent years, while other LiveCDs continued to improve and looked like more fancy tech toys to use. But! It recently got major update to version 5 and it seemed like a great opportunity to revisit and see if disc still worth attention. 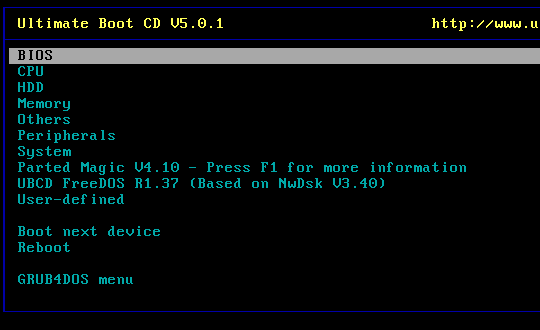 As any diagnostic LiveCD this one boots directly from disc and offers menu with available utilities. Set of applications is extensive and can be roughly described as hardware-centric. There are apps to test, stress-test and check core PC components that can be – CPU, RAM, hard drive, etc. In addition it has Parted Magic bundled, which is LiveCD with plenty of functionality on its own. All apps are either freeware or open source, with single exception of demo for Astra hardware info utility. There are also no proprietary OS components of any kind, FreeDOS is used in place of MS-DOS. I am on the fence about Parted Magic here. It is great LiveCD, but for specific task. As for me UBCD could use something more generic. There are quite a few Linux distributions around to choose from. Due to modern specifics it could also use more antivirus tools. Avira alone is not enough for dependable anti-malware toolkit. Give me Hirens Boot CD, and although there is a contention that the program (or suite of tools for repairing computers) contain payment software illegally, I like more. You name which only includes free software and I think it is very limited. Very good blog, I follow you forever. Greetings. Hiren is very good LiveCD, but it does indeed contain massive amount of payware. I won’t pretend piracy doesn’t exist… :) Still if you need LiveCD to use in work environment and such it is better to stick with free solutions like UBCD. As for me some of most used tests in practice (like Memtest) are free anyway so it doesn’t matter much if you run it from Hiren or UBCD or whatever. Okay. I’ve got a four-year-old eMachine here that I have been messing around with for some time. It was purchased second hand, and has Windows XP installed with an invalid license. The customer would like to run Ubuntu linux, but I am unable to install anything other than the original operating system from the OEM restore CD. Will this CD help me get to a point where I can load an alternative OS on this piece of crap PC? What problem exactly do you have with installing Ubuntu? If you want just nuke old partitions with data and let Ubuntu create new ones it should handle that just fine on its own. My problem is this machine will not boot from _ANY_ CD other than the factory OEM restore disk. And the restore disk is now missing. All I want is to find something -anything- that will boot this damned machine and allow me to install Ubuntu. Hm… Had you tried booting from flash drive? Maybe optical drive is old and not functioning properly, that can be enough to make it lag and ruin CD boot.